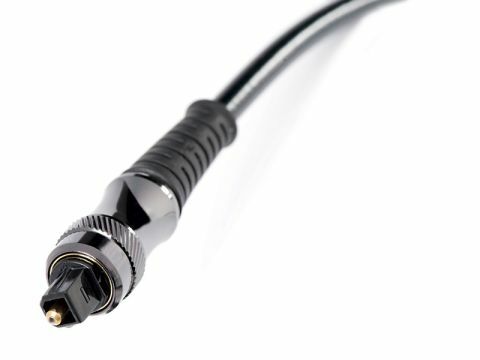 The most obviously upmarket feature of the Chord Company Optichord optical lead are the connectors, which have a metal body. As the optical fibre simply passes through them, they have no effect at all on the signal-passing properties, but they do make handling a bit more reassuring and, as Chord has taken care over the accuracy of the plastic mating parts, they fit nice and snugly into any of the various TOSlink sockets we tried. A Mini-jack on one end is an option (for portable players) and lengths up to 10 metres are available for a relatively modest premium. Each end of the fibre has been carefully shaped into a domed profile and then polished, giving optimum transmission of the light signal, even if the plug is inserted a little askew. Chord pointed out that our results would most likely vary, depending on interference levels in the vicinity and the susceptibility of the connected equipment. Complete insensitivity to electrical interference is, of course, the great advantage of optical links – that, and the lack of hum loops and the like. And sure enough, we found this lead highly advantageous in connecting the digital outputs of a PC to a Cambridge Audio DacMagic. It was superior to a giveaway optical link, producing much clearer images. At the other end of the spectrum, the excellent jitter rejection of our dCS DAC made differences between this and other optical and electrical connections much less obvious. Between a midrange CD player and DAC it was just slightly less successful than a good electrical link.